Customer relationship management (CRM) software is a big deal these days as companies align their sales, marketing, and customer service teams into one seamless unit ready to meet the needs of clients and potential clients. If your business is deciding on which CRM platform to use you’ll definitely come across Salesforce. As the market leader and a company with healthy marketing and PR teams behind it, Salesforce is one of the first destinations when researching a CRM. Another popular name is Zoho. Well known for its Google Docs competitor, Zoho Docs, this company also has its own CRM platform. Both Zoho and Salesforce are capable services that have a lot to offer; however, the question really isn’t which of these companies is the best choice but whether either of them is the right fit for you. 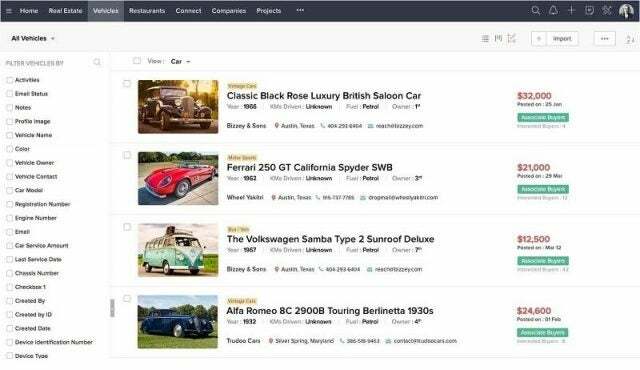 A good way to discover a CRM that can be customized for your needs is to use the handy Get Quote button included here to receive proposals that take into account your company’s unique situation. Zoho or Salesforce – Which CRM System Should You Choose? First, here’s a bird’s eye view of how the two CRM systems stack up, collecting the main pros and cons of each. When your first sign-in to Zoho and Salesforce you are greeted with a dashboard containing large rectangular tiles that display key information such as current quarterly performance, open tasks, and deals closing this month. What you see on either CRM’s dashboard is customizable to a certain degree, although the “quarterly performance” tile is specific to Salesforce’s default view. The bigger difference is how this information is presented. Salesforce opts to use a mix of graphs and lists, whereas Zoho uses all lists by default. Both CRMs use navigation menu tabs at the top of the screen and basic headings such as Leads, Contacts, Accounts, Deals/Opportunities, Documents/Files, Reports/Dashboard, and so on. Both also have a social networking style section where team members can share information in the form of posts. Contacts is a key section for any CRM and both Salesforce and Zoho cover the basics here. Zoho, however, has some nice social features that are available by default. The key one being if a sales person adds their Twitter, Facebook, or Google+ account, and then adds the corresponding social account for their contacts, they can view their contacts’ social activity within Zoho’s CRM. This is a great feature if you run a business where most of your interactions happen on social media. Salesforce can do something similar with a lot of powerful tools for social media monitoring, but it requires Marketing Cloud, which is a service beyond Sales Cloud, Salesforce’s basic CRM. Speaking of marketing, Zoho’s core features are a mix of sales, service, and marketing tools whereas Salesforce’s Sales Cloud is all sales. The core focus of Zoho’s basic CRM is also sales of course, but it includes spaces for recording marketing campaign records, and integration with Zoho Desk, a customer service platform for your website. Looking at both services from an ease of use perspective there’s no question that Zoho wins this face-off. Salesforce has an absolute ton of features and options to tweak. The basic categories are easy enough to understand, but there are many ways to customize the service and many extra features to explore, not to mention a thriving third-party app marketplace. Zoho is more straightforward with a cleaner look and about the same number of menu tabs as Salesforce. Zoho’s third-party integrations aren’t as deep as Salesforce, but if you’re looking for simplicity then that may be less of an issue unless there’s a particular third-party tool you absolutely must use. If you’re interested in harnessing computing power with your CRM for showing insights into your business, improved workflows, and other suggestions, both services offer this kind of powerful feature in the upper pricing tiers. Zoho’s is called Zia AI (Artificial Intelligence) and you can use it as a chatbot to surface key data on demand including record data, dashboards, and reports. Zia can also predict the probability of success for leads and deals based on historic performance. 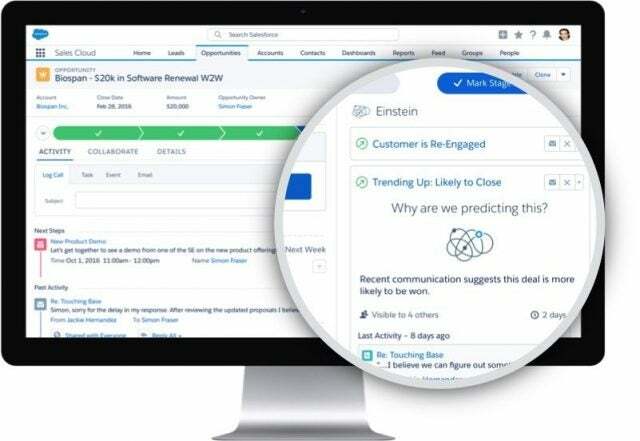 Salesforce, meanwhile, has Einstein AI, which can also surface predictions and recommendations based on the data saved in the CRM. Like Zia, Einstein has predictive capabilities to see the likelihood of successfully converting leads and opportunities, as well as forecasting sales data. Both Salesforce and Zoho offer their AI features with their higher-priced Enterprise tiers, though Zoho does offer Zia’s automation intelligence features starting with its Standard package. Any small business looking at these two CRM platforms first has to consider the onboarding process. If you just want to get up and go then Zoho is probably the better option. It’s easier to understand, and the interface is less intimidating. Zoho also specializes to a certain degree in small businesses, though there are tools for enterprises as well. Conversely, Salesforce can work for smaller companies, but it has that “large organization” feel with its powerful interface, administrator panel, and vibrant web developer tools. Salesforce is also more clearly delineated with sales, service, and marketing tools all part of different products. Zoho, by comparison, has some basic marketing and service tools integrated with the CRM, as mentioned above. Of course when it comes to deciding on a CRM, price is a big consideration. For extremely small teams Salesforce has its Essentials package that charges $25 per user, per month for up to five users on Sales Cloud or Service Cloud. Larger teams will need to pay for the Professional, Enterprise, or Unlimited tiers priced at $75, $150, or $300 respectively per user, per month. To get both clouds, you’d need to pay $100, $175, or $325 for each respective tier. As you increase in cost you get more customizability, more tools and features, and enhanced support options. Zoho starts with a free service for up to three users that includes its basic CRM. If you need the CRM for more users or with more features such as sales forecasting, customized fields and modules, and macros then you need to pay. Zoho Standard costs $12 per user, per month, Professional is $20, Enterprise is $35, and Ultimate is $100. Zoho’s website breaks down the advanced features you get as you go up in price. Both Zoho’s and Salesforce’s pricing tiers are priced monthly but billed annually. For companies unwilling to commit to a full year, Zoho allows for month-to-month pricing at a higher cost. Choosing a CRM comes down to what’s right for your company’s needs and workflow. In general, however, Zoho seems like an easier choice for smaller businesses since orientation and training should be less intensive, and pricing is a little more reasonable for budget-sensitive teams. For extremely small teams, however, Salesforce does have some pretty good pricing with its Essentials packages, as long as Sales and Service Cloud are all you need. But Salesforce Essentials is still more expensive than Zoho’s two starter pricing tiers. If you have a five-member team filled with Salesforce veterans then perhaps that extra cost is worth it, but most small businesses should take a hard look at Zoho before opting for the “trendier” solution. Don’t just stop at these two platforms: there are a ton of other companies besides Zoho and Salesforce that can offer a capable CRM. To make sure you’re getting a CRM suited for your company, click the Get Quote button above to receive customized quotes that take into consideration your company’s particular situation and needs.